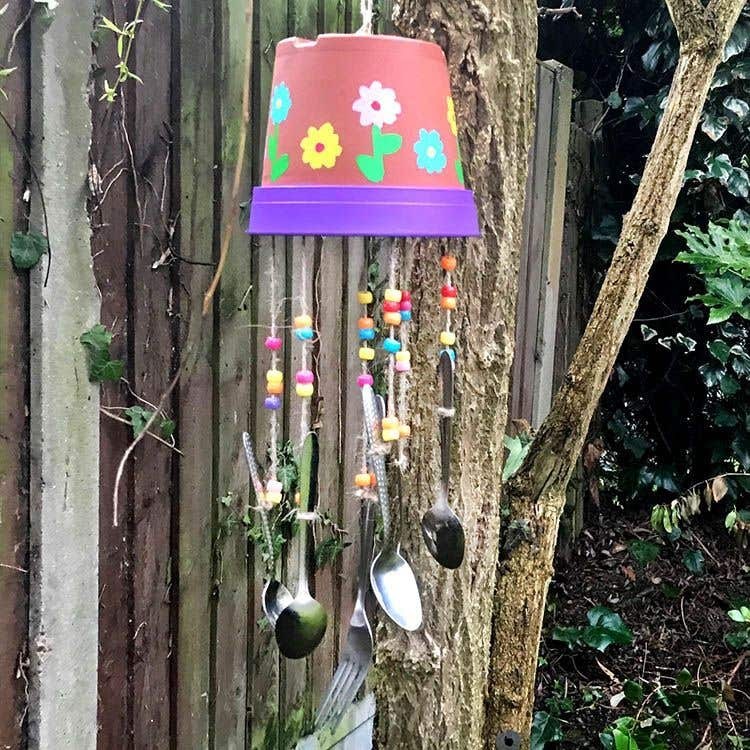 Create this novel, tinkling wind chime for your garden this summer by up-cycling a plastic flower pot, old cutlery and beads. Turn the flowerpot upside down. Paint the rim of the flowerpot a colour of your choice using deco acrylic paint. Leave to dry. 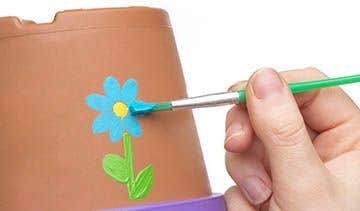 Decorate the plastic flower pot with deco acrylic paint. You could paint patterns, swirls or spots, flowers or anything you like. Leave to dry. Paint a layer of HobbyLine Acrylic Satin Varnish onto the plant pot to make it waterproof. Leave to dry. 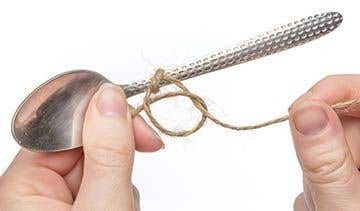 Tie a piece of jute twine in a double knot to the middle of a spoon. Cut the jute twine length to be as long as you want your windchime to be. Seal the knot using the glue gun, leave to dry. Repeat this step until you have double knotted all of your spoons with a piece of jute twine. Try and make the jute twine roughly the same length for each spoon. Tie a piece of jute twine in a double knot to the middle of a fork. Cut the jute twine length to be 1-2cm shorter than the length of the jute twine holding the spoons. Seal the knot using the glue gun, leave to dry. 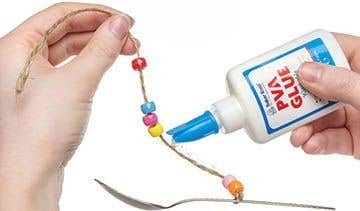 Spread some PVA glue onto a piece of jute twine that is holding a spoon, then thread on about 5 or more brightly coloured beads. Spread the beads out along the string and leave them to dry on the glue. Repeat this step until all the spoons have been beaded as well as the fork. Leave to dry. To create the wind chime hanger, tie a piece of jute twine to the top of the flower pot by threading a loop through the central holes and tying a double knot. Seal the knot using the glue gun, leave to dry. Attach the top of each piece of string tied to a spoon around the inside of the flower pot using waterproof duck tape. Make sure the spoons are attached evenly around the sides going round in a circle. Attach the top of the piece of string that is holding the fork to the inside roof of the flower pot in the centre using waterproof duck tape. Check that all of the pieces of string are at a good length for the spoons and fork to hit into each other when the wind blows to create a relaxing tinkling sound. Always seal and waterproof all surfaces with clear acrylic varnish when placing anything outside exposed to the elements. This idea also works well using old keys instead of cutlery.